I am greeted as the “Lego Lady” when I enter my library and I couldn’t be happier about it. I’m not the first library Lego Lady, and I won’t be the last, but I’m glad I am one for the moment. A few weeks ago, I met with the library director and she mentioned that she was looking for one more idea for a February break activity. I mentioned Legos and we began planning. We had the time, we had the space, and we were certain we had the interest of our community kids–all we needed were Legos. We put out requests to library regulars and the community at large through word of mouth, the library’s web site and Facebook page, and our personal social media accounts. We contacted stores that might donate. We even devised a way to offer people the chance to donate a few of their treasured toys to the Lego cause by placing labeled, quart-sized donation bags for library patrons to take home, fill up, and return to the library. In addition to collecting Lego bricks, we went into high gear surveying library web sites for Lego Lessons Learned and contacting friendly librarians who could share their Lego Library Wisdom. We also continued to get the word out about the program, and I was excited every time I walked into the library to hear there had been more calls inquiring about it! The Association for Library Service to Children’s The Importance of Play, which offers links to white papers, planning toolkits, and programming tips from librarians who have run “play” programs in their libraries. The American Library Association’s Programming Librarian web site is also a treasure trove of articles, programming ideas, planning guidance, and practical tips for implementing a successful library program. And, the Words to the Wise page found through the University of Illinois’ Library and Information Science course web about program planning for tweens. The page is well-cited and part of a larger project about serving tweens in the library that is wonderfully organized and contains some fundamental ideas applicable to planning meaningful programs for any age group. 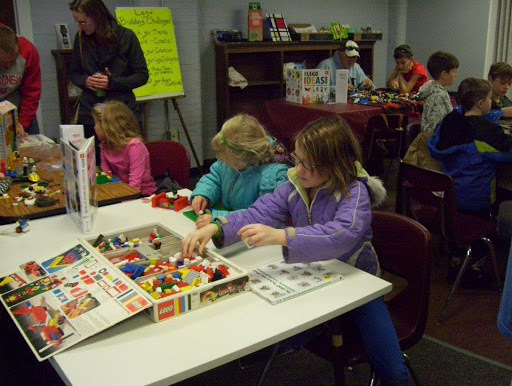 Our Lego Challenge was a blast to be a part of, and we ended up with 29 kids, ages 6-16, in attendance. We also had 11 grown ups attend, many of whom enjoyed building with their children! In my library school, we are in the habit of listing the Top Few Take-Aways from classes, events, and experiences as a way of synthesizing information into usable bits for later. 1. 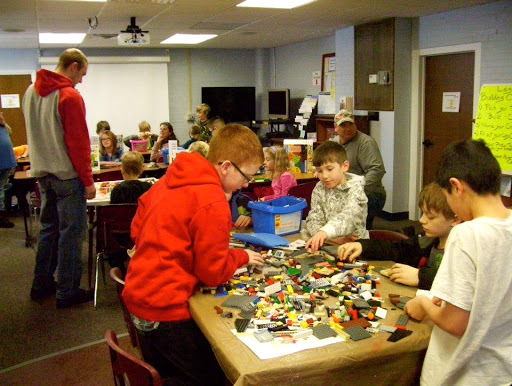 Lack of Legos does not equal Lack of Lego Program–Look to your community for creative ideas to overcome that obstacle. We solicited donations, but also invited participants to bring their own Legos. We posted friendly signs to remind participants that we wanted everyone to “go home happy,” so they were responsible for keeping track of their own legos. 2. Provide Idea Kick-Starters–Find books in your collection to place around the building area. We also provided themed tables with Idea Table Tents on each table, along with a few direction sheets for simple projects that could be completed with basic blocks. Lego’s website was a great resource for this. 3. Recognize All Your Builders–Whether you choose to have prizes or category champions, find a way to recognize all of the participants for their building efforts. We chose to make a Certificate of Building Achievement for each participant on which we recorded the builder’s name and a detail that made their creation unique, then we took a photo of each builder with their creation. 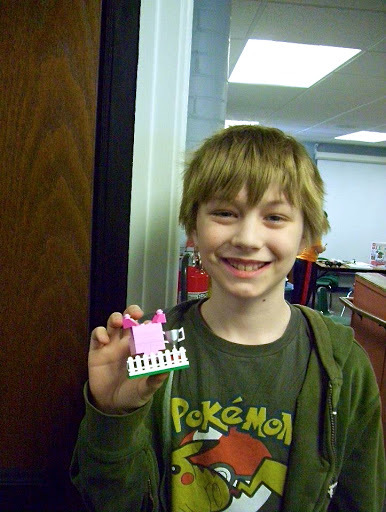 We had parents choose whether to give permission to post builder photos on the library web site and Facebook page, and the participants were excited at the prospect of seeing their projects online.